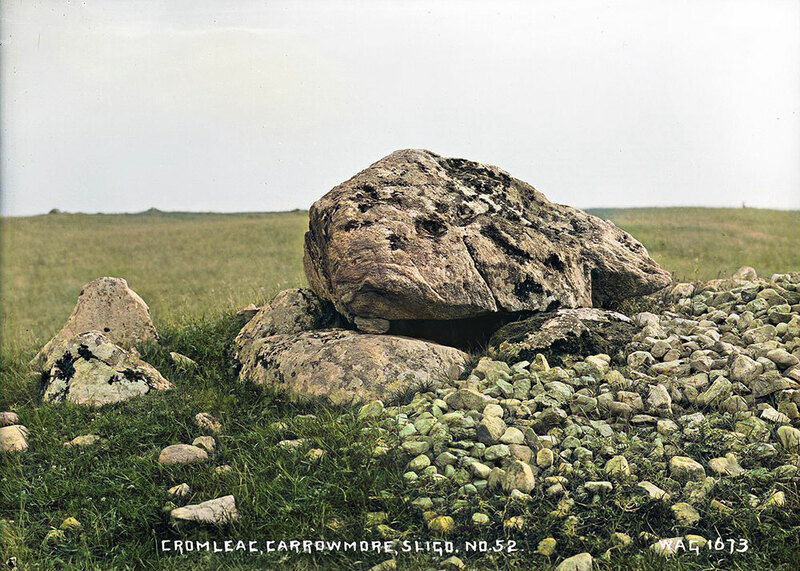 A fantastic image of Carrowmore 52 photographed around 1900 by Welch. 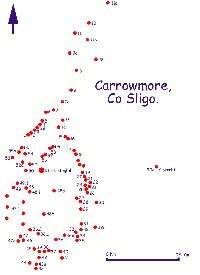 These four sites are situated on the northwest side of Carrowmore, and complete the large oval chain of circles, Site 55 bringing us back again to Circle 1. Site 52 is a fine example of a split boulder dolmen supported by five uprights. petrie reports that this site had a fine big circle, removed not long before 1837. The dolmen is surrounded by a small cairn composed of stones cleared from the field. Carrowmore 52, a split boulder dolmen with a tiny chamber under the capstone. The view is to the southwest to the restored cairn at the central monument of Listoghil, and beyond to the cairn topped summits of Sliabh Dá Eán. Site 53 was buried under a field wall for many years, until it was liberated by excavation around 1998. The site is partially destroyed by a quarry on the west side. A fairly long passage points in to Listoghil. Site 54 is another small dolmen, very like Site 52. Again, it's circle was removed not long before Petrie's visit. A piece of Carrowkeel ware was found in this chamber. Site 55 was a cairn of stones cleared from the field. The excavation revealed that it was the remains of a small destroyed circle. Borlase: - No. 52. 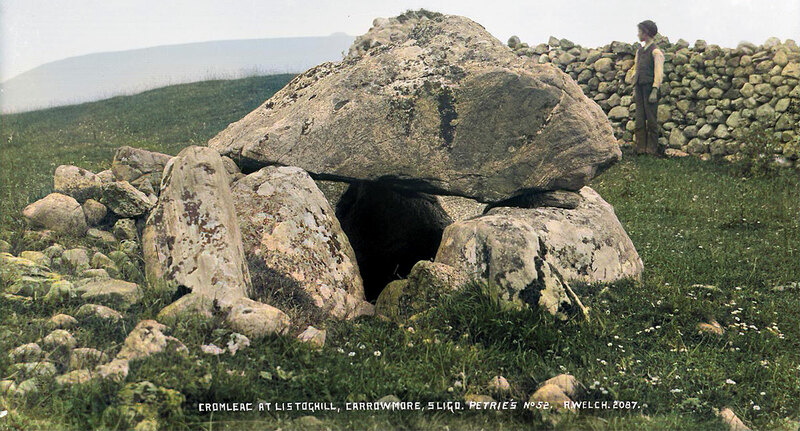 Situated about 70 paces to the Northwest of the cairn called Listoghil (dolmen-circle). "This, which was a large circle, has been recently (in 1837) destroyed for the materials which it afforded to build the wall connecting the field boundary in that direction with the road. The cromleac, however, which is a very large and apparently double one, still remains, but is in great part buried in stones collected to clear the adjacent fields." - Petrie. The cromleac, which is a fine specimen, remains. Its porch-like entrance is very remarkable. possibly it may have been a double or figure-of-8 dolmen." - Wood-Martin. 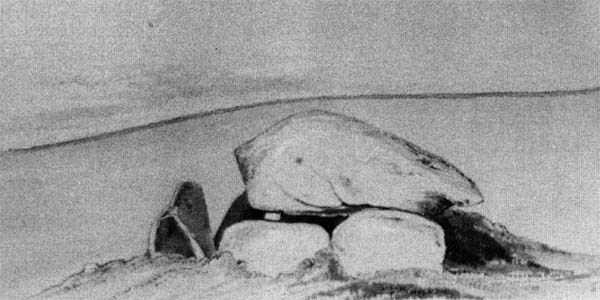 William Wakeman's drawing of dolmen 54 in 1882. The dolmen measures 4 feet 6 ins. in height. Its long axis is Northwest and Southeast The roofing-stone, which measures 5 feet 8 ins. by 5 feet, and is in the centre about 2 feet 6 ins. thick, rests on 4 stones, 2 on either side. The stone at the north-west end is missing; and the antechamber, porch, or continuation at the south-east end is formed by 2 uncovered stones. The gap or slit connecting this with the interior of the dolmen is only 6 inches wide. "In this cist there were six hundred and fifteen fragments of bones, all small, greyish-white, ashen-coloured and calcined. With them were two teeth (of a ruminant), part of the tibia of bird (curlew or plover), and a, piece of shell (Helix). Twenty of the bone fragments exhibited the peculiar transverse crack-like' marks alluded to in preceding interments," - Wood-Martin. 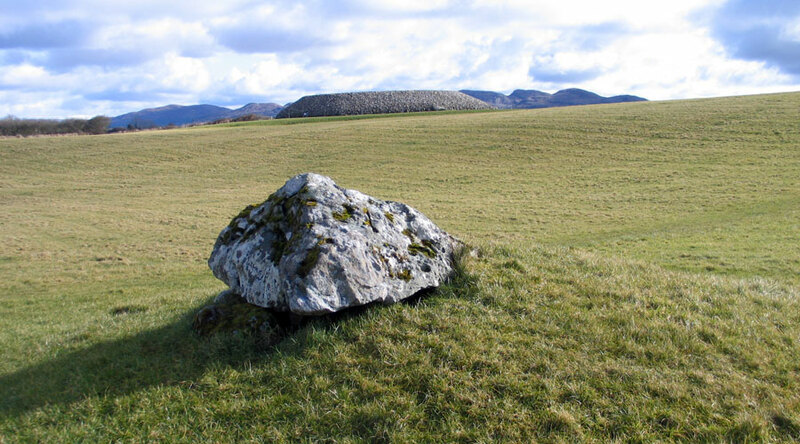 An old image of Carrowmore 52 by Welsh. LXV. No. 53. Situated on the same field-boundary as LXIV, within about 100 feet of the road (dolmen-circle). "A few stones of this circle only remain. It was destroyed a few years ago by Mr. Walshe's herd, by that gentleman's order. (a) Bones, which, according to Dr. Frazer, are all human, and had been imperfectly burned. They belonged to an adult, advanced in years, judging from the teeth and a fragment of the jaw with two molars and three incisors much worn down. were also portions of crania, thigh bones, etc. (b) A fragment of rude pottery, yellowish drab in colour, and 1 inch in thickness, being evidently part of a large vessel imperfectly burned. For the purpose of giving consistency to the material, small pieces of shells and pebbles had been mixed with the clay of which it was composed. The fragments of shells and stones are not apparent on the surface of the vessel, but become visible only where it has disintegrated, or has been chipped or fractured. This specimen of pottery exhibits six rows of rudely punched depressions lnade at an angle downwards from the rim or lip of the vessel. The two lower lines had evidently been punched with an implement of larger size than that which produced the upper marks. The rudeness of this fragment contrasts greatly with the finer specimen of pottery found in the South cist of XXXVII "to which a mixture of micaceous clay appeared to have given great consistency." (c) Fragment of a flint-flake. (d) Shells of Mytilus edulis (mussel), Litorina litorea (periwinkle), Litorina rudis (one specimen), Cardium edulis (cockle). (e) An irregular mass of yellowish quartz, weighing 1 lb. 2 oz - Wood-Martin. 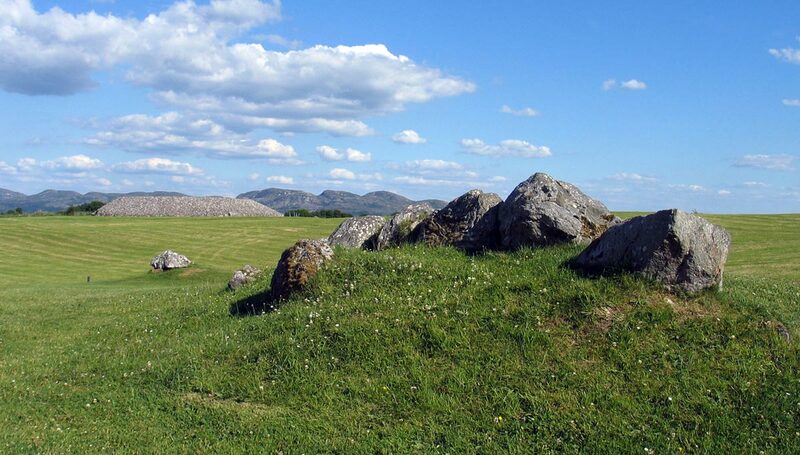 Carrowmore 53, buried under a field wall for years, was excavated by the Swedish research team. The view is to Site 52, the small dolmen, and Site 51, the large cairn. Sliabh Da Ean is the mountain in the distance.